First and foremost, family planning supports later childbearing and healthier birth-spacing, which turns out to be very, very good for both moms and babies. Research has shown that if there were at least two years between a birth and a subsequent pregnancy, deaths of children younger than five would fall by 13%; if the gap were three years, such deaths would decrease by 25%. Over 300 million women in the world currently suffer from long-term or short-term illness brought about by pregnancy or childbirth, limiting their options for safeguarding themselves and their families in the face of natural disasters like drought, floods or heat waves. Family planning can also help women and girls complete their education – one of the general building blocks of resilience for society. Early childbearing is associated with early departure from school for young women, meaning many never get the education they need to realize their full potential. When women are educated, their options multiply and their earning power increases – money which is often invested back into the family. Educating girls and women is one of the best ways to lift families out of poverty, which ultimately builds healthier communities AND a healthier environment. When parents are able to space their births and have fewer children, they are better able to invest in their children’s health, education, and well-being. That gives kids a head-start in life, puts families on a path toward greater resilience, and allows community development that is truly sustainable. If every woman around the world had access to family planning, and could determine the number and timing of their children, future population growth would be slower than most current estimates. That by itself would dramatically reduce pressure on natural systems that are already over-taxed. Research shows that a host of environmental problems—including the growth of greenhouse gases, food and water scarcity, and biodiversity loss—would be far easier to address if world population peaks at 8 billion, rather than climbing to 11 billion or more. Slower population growth would help strengthen communities’ ability to adapt to the impacts of climate change that we are already experiencing. Yet right now, many of the regions of the world that are most vulnerable to climate impacts also offer the least access to family planning options. More than 200 million women around the world still lack the family planning that would enable them to determine the timing and spacing of their children. We can and should do better. 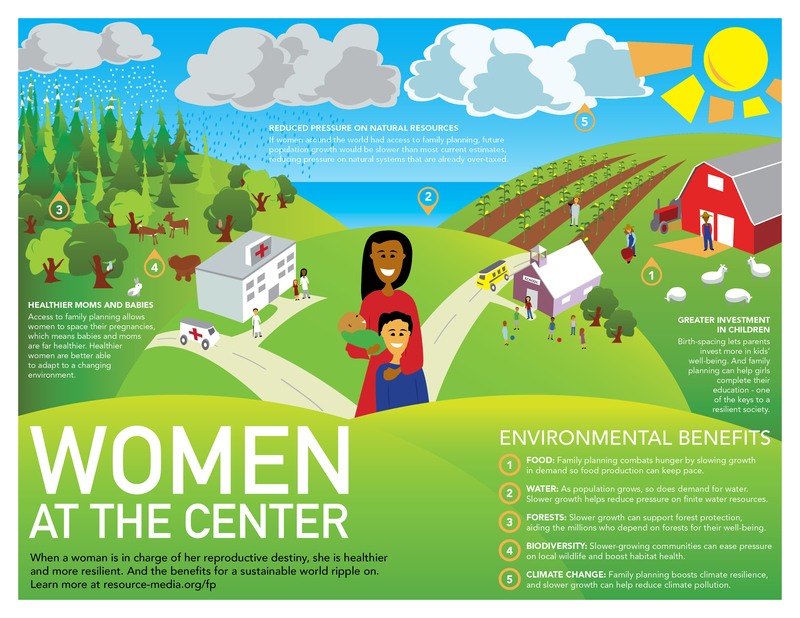 When women are in the driver’s seat of their reproductive destiny, their lives—and their families and communities—are healthier and more resilient. And the benefits for a more sustainable world ripple on. You can download the infographic here. Pass it on!